Vacuum sealing technology is an excellent way to prep ahead of time, enabling you to batch cook delicious and healthy food for all the family that you can then seal and save, freeze and reheat whenever you are running short on time and need to grab something tasty and nutritious. It’s also a great way of ensuring that none of that weekly shop goes to waste by vacuum sealing any produce that might otherwise have gone off and ended up being discarded in the bin before you’d had a chance to eat it. 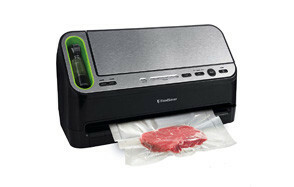 In fact, with the best vacuum sealers, you can keep your food fresher for longer. In some instances up to five times longer which over a year clocks up to quite a saving. Air is the enemy of food freshness so by extracting it with a vacuum sealer, you can keep the food you store in the fridge and the freezer tasting delicious and fresh and bursting with its original nutritional value. Let’s take a look at the best vacuum sealers currently available. Ready to start your food sealing adventure? Great, then let’s get things started with our Best Choice product today which is the Automatic Vacuum Sealer Kit from NutriChef. The price is as unbelievable as the results are impressive and if you want to preserve the freshness of your food for longer and eliminate bacterial growth, then this will be a wise investment for your household. The NutriChef food sealer can even be used to marinade meat and help you catch cook ahead of schedule and plan out your meals for the weekend ahead. It’s nicely compact as well as being lightweight too so it can easily be placed where you can conveniently access it on your countertop. It also features a stain resistant housing, so you don’t have to worry about any damage from accidental spills. The NutriChef seal a meal vacuum sealer can be used on both Dry and Moist food and has two separate programs for each plus it features automatic touch button operation for a simple and practical user-friendly experience. A selection of different sized bags are included with your starter kit which are re-usable and waterproof plus a wine stopper cork is also included so that you can prolong the lifespan of that opened bottle of wine you didn’t polish off! If you are looking for a cost-effective and convenient way to start sealing in the freshness, then the NutriChef is a fantastic introduction to the world of food vacuum sealing. 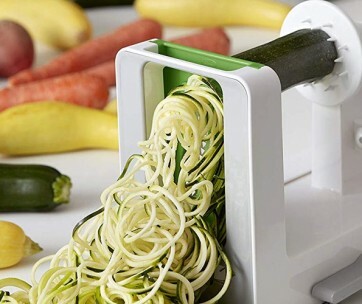 Make sure you also check our guide to the best spiralizers. We’re going to our first vacuum sealer from market leading brand, FoodSaver next and taking a look at one of their cost-effective and entry-level machines that comes as part of a Start Kit with everything you need included to start sealing and saving. FoodSaver is still #1 when it comes to vacuum sealing technology, so it’s definitely a smart investment from a brand with a high pedigree in the category. So can trust them so much that they even offer a generous 5-year limited warranty. FM2000 food sealed inside a bag using the FoodSaver system is guaranteed to stay fresher for longer, in fact up to fives times longer which could work out as a significant saving overall on that annual grocery bill. Just think about all the food you won’t waste and throw in the bin because you were able to seal and store it? If you care about the environment as well as your family’s nutrition and your own bank balance, then it certainly makes a lot of sense. The unit itself features simple one-touch operating and comes with an accessory port as well as an extra wide sealing strip. Using your FoodSaver couldn’t be easier; you just fill one of your sealing bags with produce and direct the open end towards the sealing channel. Close and lock the door then press the vacuum seal button. That’s it! Everything you need is included in this starter kit along with bags in a range of different sizes from 1-quart to an 11” x 10” vacuum seal roll. When you’re done saving and sealing, cleaning up is also a breeze thanks to a patented, removable drip tray which is dishwasher safe and helps to keep your countertop clean. 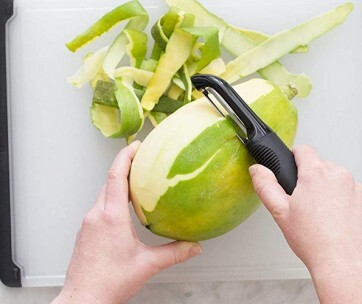 Our handy guide to the best vegetable peelers features more great products like this. Moving up a notch slightly price wise but still coming in at sub the $100 bracket with the current promotional offers available, we have the Nesco VS-12 Deluxe style food sealer. This is the first of our models to feature a double line seal for extra strength and a robust and reliable seal. The unit itself is compact and neat and certainly looks very stylish too. Perfect for staying out on display on your kitchen countertop. That way it can be permanently on hand which is great, especially if you are a fan of regularly saving and sealing and like to do a weekly batch cook of all your family’s favorite meals. We love the sleek lines and modern design aesthetic of the unit, especially in polished silver and black. Features wise, it comes with a front locking handle for hands-free sealing and also has variable settings too so you can choose between regular or a gentle option. That gentle setting is great for more delicate vegetables and biscuits and cakes or example that will be more prone to crumbling and breaking up. It delivers a controlled pulse so you can stop and seal to suit your needs. When it comes to that all-important sealing function, again, you are faced with options which include Dry, Moist or a Double seal for when you really want to be sure that your contents are art tight and secured before you freeze them. The design also features a bag roll storage compartment as well as an integrated bag cutter. Love this product? 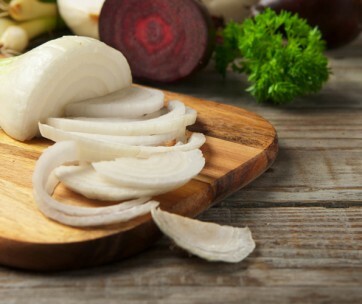 Check out our review of the best chopping boards for our top picks. We’ve cranked up the gear, the functionality, the features and yes, the price with our next best vacuum sealer and have headed back to market leader FoodSaver to see what else they have in their impressive range. We’ve chosen their V4400 as our Premium Pick and what sets this apart from the competition is that automatic bag detection feature. If you’re a lover of getting your money’s worth and like to recycle your leftovers as well as plan your meals ahead of the week, then you will definitely appreciate the convenience of vacuum packing. With this latest model from the #1 brand in the category, all you need to do is place the bag in the vacuum chamber and let the machine take care of everything else. It detects the bag size for consistent and secure sealing. Besides that automatic bag detection which is such a popular addition, the V4400 also has built-in roll storage with a cutter so that you can make your own custom sizes bags. LED lights also guide you visibly through the sealing process while a further automatic moisture detection setting switches to the correct mode to ensure the right level of seal is achieved. As with the previous model from FoodSaver which we reviewed earlier, that FM2000, again you get a patented, removable drip tray which catches any overflowing liquid and is dishwasher friendly. Everything you need to start your super sealing kitchen obsession is included with this comprehensive starter kit with both quarts, and gallon sized seal bags, and zipper bags included. It’s also compatible with a host of accessories and bags from the FoodSaver range. It’s a slightly different design and is more upright, but it should still be compact and neat enough to fit pleasantly on most kitchen countertops. This is a great kitchen gadget you need to have. Next up we’re taking a look at what Geyron has to offer with their starter kit. This 4 in 1 Automatic Vacuum Sealer from their range comes with 6 different food settings as well as 2 distinct pressure options. There’s a gentle mode for more delicate baked goods along with a normal function. With this prep and preserve system you can keep foods fresh for up to 5 times longer which means your household budget can stretch that little bit further and you end us with less weekly food waster. That’s got to be good on some many levels. If you also fancy yourself as a bit of a Master Chef too, you can experiment with Sous Vide style cooking, using your vacuum sealed pouches. The Geyron machine is fully automatic and features stylish soft touch operation controls which are conveniently placed in the center of the unit where they are easy to see and access, along with an LED light indicator. It’s a compact and sleek design which you won’t mind leaving out on display rather than having to store away after each use. When it comes to cleaning your unit, the upper lid easily life off so that you can clean the chamber as well as reaching the gaskets easily and safely too. A full starter kit is included which besides that powerful two setting vacuum sealing appliance, also comes with a vacuum roll, pre-cut bags a vacuum tube as well as a comprehensive user manual. Oh yes, and did we mention, the price! Well, it’s sub $50. How’s that for money saving, never mind food waste and time-saving too by allowing you to conveniently prep ahead and batch cook family meals. You also happen to be leaving a smaller carbon footprint so if you’ve not yet switched to using vacuum sealing technology in your kitchen, don’t you think that it’s about time you did? If you love kitchen products, check out our guide to the best smart kitchen gadgets. If you are a lover of hunting, fishing and then eating your game, poultry and harvested fish, then this GameSaver Outdoorsmen will no doubt get your vacuumed seal of approval! Designed with ease of operation in mind and perfect for camper, RV or cabin and not just for your kitchen, this unit comes with a strong airtight seal and can be used with customizable bag sizes. It’s perfect for sealing small game birds, waterfowl breast and even fish fillets up to 2 to 3 pounds. According to the manufacturer’s recommendations, you can seal your game for up to 3 years and with normal operating instructions, perform 40 consecutive seals which means you could continually process up to 120 pounds of game. It will help to keep all the foods you seal fresher for longer, in fact up to 5 times longer and helps to prevent unwanted freezer burn which can taint the flavor of foods stored regularly in your freezer or mini fridge. The vacuum sealed bags used with the GameSaver Outdoorsmen system have been specially designed to be heavy duty and multiply so that they blow out oxygen as well as that moisture content. The unit itself features an extra side sealing strip as well as an easy lock latch that securely closes. A range of accessories and bags are supplied as part of this starter kit. We’re staying at the budget-friendly end of the market with our next best vacuum sealing machine which is from Crenova. We’ve hand-picked their Crenova V60 to be our Best Value recommendation, and as they say, it really is a must-have appliance. That’s especially true if you love your food but also want to save time and money. If you have extended family come to stay or a party event in the diary, you can prep and seal ahead of the big day, safe in the knowledge that your creations will stay as fresh as the day you made them. If there are any leftovers, the only Doggy bag you need to worry about is your own save and seal one! The Crenova V60 Plus, food sealing system, comes with everyone you need including a free vacuum pipe attachment so that you can quickly get starting with sealing in the freshness. It also has a convenient built-in cutter so that you can custom make your own sized bags in seconds. Better still, it has two modes of operation so you can seal both Dry and Wet produce, creating an air-tight seal with both. If you want to free up space, save food, and plan ahead, then you really should invest in a food sealing machine. Once you start using one, you’ll never look back and wonder how you ever managed your leftovers before now! Prepare to save yourself both time and money and to do your bit to save the planet too. Find more great products like this by checking out our guide to the best deep fryers. 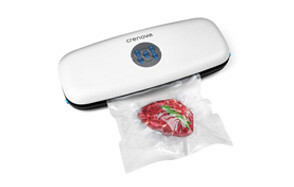 Like the Crenova we just reviewed, this vacuum sealer from Mueller Austria helps you to save time and money, prepping and sealing, batch cooked delicious meals for the family, ensuring you always have a fresh home-cooked meal ready to defrost when you need one. It’s super easy to use with a simple plugin electric design and an elegant central control panel. With soft touch digital buttons and smart LED light indicators, you can conveniently choose from two separate sealing modes. Whether you are preparing to seal Dry foods or something moist like a Stew or Casserole, this Mueller unit can do the lot. You can cancel any operation at any time simply by pressing the stop button, otherwise, just vac and seal. It’s as simple as holding down the button until you are happy that your foods are securely vacuum sealed. The unit itself is lightweight and compact and minimalist looking with a sleek white housing. If you wanted to leave it out permanently, it wouldn’t take up too much space or cause too many distractions. You get a complete starter kit with your purchase which even includes a wine stopper cork. Perfect for those among you frequently leave half a bottle of wine and want to savor the full flavor at a later stage. We’re not sure how many of you there are, but we thought it worth mentioning anyway! Don’t forget to also check our guide to the best food dehydrators. This Hamilton Beach 78220 model vacuum sealer certainly looks the part with its sleek polished stainless steel finish. With an easy to operate central control system, there are 5 vacuuming, and sealing settings included to provide you with the maximin versatility and usability. By sealing fresh prepared food or leftovers in the vacuum sealing machine, you can prevent nasty freezer burn, even if you are storing your meats and fishes for months to come. Your food vacuum sealer from Hamilton Beach features a built-in cutter so that you can customize the size of the bags you use from the roll storage bag integrated inside your machine. The unit features versatile controls with a setting for Dry foods as well as Moist and also a Normal and Delicate mode too so that you can seal a wide variety of different food sources. With this starter kit from Hamilton, you will receive enough materials to seal 20+ gallons, and when you do need to purchase more rolls and heat-seal bags, the unit is fully compatible with FoodSaver accessories. If you want to preserve the freshness of your food sealing everything from fish to herbs, then the Hamilton Beach 78220 is an excellent option. You may also like to check our guide to the best air fryers. We’re rolling out the big guns with our final product selection which is the perfect industrial style sous vide vacuum sealer. The price might make your eyes water but the results certainly won’t. This is no general use food sealer, this is restaurant quality or for a home where fine dining and frequent entertaining features high on the agenda. It’s just shy of $1000, so you really need to love your food to get the benefit from this bad boy. It’s much bigger and boxier design than the other units we’ve reviewed but is elegance nonetheless and coated in black high-grade stainless steel to look modern and streamlined. There’s a slick control panel, and the chamber is strong and large enough to take all kinds of loads. You could pack in 15 chicken drumsticks! While the unit might be expensive, one of the advantages of the Vac-Vida VS301 is that you can use it with any page you like, even cheaper style ones and of course, being durably constructed it is more than capable of withstanding constant and repeated use. The Vac-Vida has raised the bar when it comes to vacuum sealers and successfully designed an elegant and sleek looking professional quality machine. 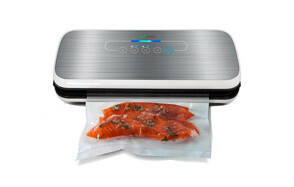 In order to pull together this comprehensive and detailed review of the best vacuum sealers currently available, we researched across the entire category and left no stone or consumer review unturned! We’ve selected a broad and representative cross-section of popular and market leading brands all of which come highly recommended with overwhelmingly positive reviews and feedback. With Vacuum Sealers, as with most domestic and kitchen appliances, you get what you pay for and if you require more bells and whistles and advanced functionality, then the more budget you are able to allocate, the better. Decide first which are the “must have” features that you require and start from there. Below are some of our top recommendations on what to look out for in your vacuum sealed. Rollers & Cutters - Vacuum Sealers require bags to store the food you are sealing in that air-tight condition. If you don’t want to have to determine for yourself the correct size and shape of bag from a long roller plastic, then it’s a good idea to invest in a machine that features an integral cutter and roller system that will do that work for you. It’s one less hassle for you and one more function that your sealer can perform. Wet Sealing - There’s a very popular movement in the culinary world towards using the sous vide method which produces succulent and tender results, bursting with flavor from the liquids used to marinade the meats and stews you’ve prepared. If you want to be able to seal your creations alongside sauces, gravies, and marinades, then you’re going to require a machine that allows you to wet seal or better still, one which also has a marinade mode. Marinading can often require your vegetables, fish, and poultry, for example, being left overnight to produce the best results. Imagine then if you can speed up that process and still serve succulent and juicy food bursting with all that marinaded flavor. If you love BBQ’ing, then this is a must-have feature. One extra word of caution, if you do intend wet sealing and marinading, just check that the machine you are purchasing also has a drip guard to catch all of that extra liquid otherwise you are in for a lot of mess and clean-up afterward. A removable drip guard is your best bet. Pulse - Depending upon what types of foods you intend more regularly sealing with your machine, a pulse mode might be something that you find useful to have. If you love leafy vegetables for example which have more of a tendency to break up and disintegrate if you apply too much pressure at once, then a controlled pulse mode will be beneficial. That way you can keep a close eye on the air being evacuated and stop it if your food looks like it’s about to get crushed and mangled up! Maintenance & Cleaning - These two points are also important to consider. If your machine is difficult and cumbersome to clean and requires lots of routine maintenance, the chances are that it will just get pushed to the back of the cupboard never to see the light of day again! So go for a model that is user-friendly, easy to clean and maintain but that still represents good quality manufacturing and value for money. If you’ve already started doing your research on the subject, then you will have discovered the there are two different types of food sealers that are available. You can find smaller external style sealers alongside larger chamber models. Generally speaking, they do both operate similarly in terms of extracting air out and then sealing against air and moisture subsequently being able to enter back in. Let’s just take a quick overview of the key differences between the two machines. Chambered Vacuum Sealer - Much larger and bulkier looking machines, these do all of the work inside and are fitted with high-powered pumps that are capable of extracting much more air at once so make it easier to seal large joints of meat with their natural juices. These models are more expensive and are typically favored in a commercial environment or professional kitchen where bulk sealing of produce may be required. They will also more often than not include adjustable suction levels rather than having just the one standard setting. External Vacuum Sealer - With an external vacuum sealer, you have more flexibility and space also. They’re smaller and less expensive units best suited to more occasional rather than daily use, and most will conveniently fit on a kitchen countertop or even in your hands. You should also be able to use them with a versatile range of bags to seal your produce.